Heart Shaped Strawberry Cake.Strawberry flavor is quite popular among cakes.We excel in making mouth watering fresh strawberry cakes. 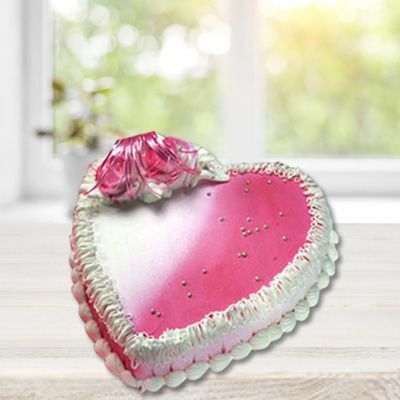 Our strawberry cakes are not only delicious but the pink heart shape looks cute as well.The heart shaped strawberry cake is beautifully decorated with cream and is quite a treat.Send cakes online and convey best wishes to your loved ones.Our strawberry cakes are ideal for all occasions such as anniversaries,retirement, graduation, baby shower etc but they are especially suited for birthdays and Mother’s Day.Tell your mom how much you love her by sending her this cake on Mother’s Day.We offer home delivery service and special midnight delivery service for your convenience. If you want any flavor other than Strawberry ( Except Chocolate / Blackforest ) , you can specify in special instruction box step-3 and Image may vary according to the Flavor.